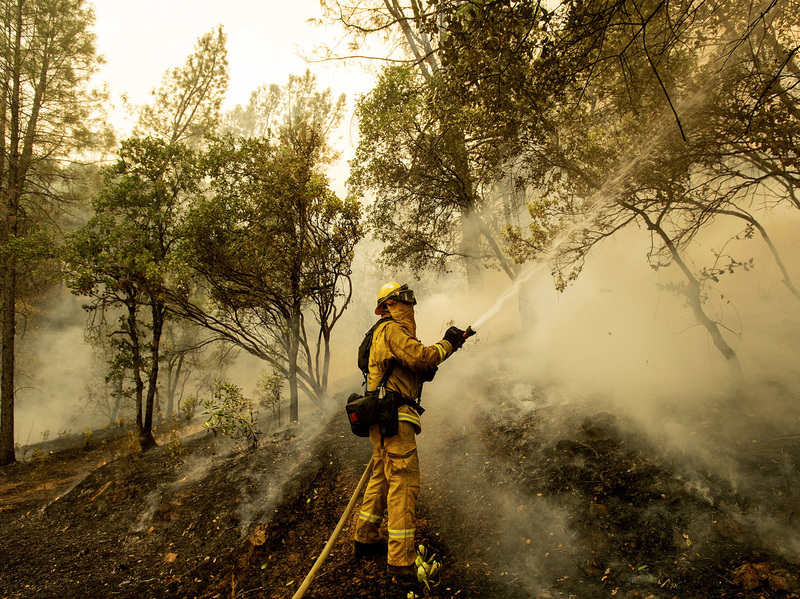 6 Dead As Carr Fire In Northern California Continues To Burn Officials are expressing some optimism, saying a break in the strong winds have helped them go on the offensive against the fire that has engulfed more than 95,000 acres north of Sacramento. A firetruck drives along Highway 299 as the Carr fire continues to burn near Whiskeytown, California on Saturday. Firefighters continued throwing resources into containing the Carr Fire, which has engulfed 95,368 acres and forced the evacuation of some 38,000 people. It is just 17 percent contained, according to Cal Fire. The Carr Fire, which is the largest of 17 wildfires burning in California, has destroyed or damaged more than 1,000 structures in Shasta and Trinity counties, about 150 miles north of Sacramento. Meanwhile, in central California, where the Ferguson Fire near Yosemite National Park has grown to 54,481 acres with 30 percent containment, a second firefighter has reportedly been killed. Brian Hughes was struck by a tree while removing brush in an effort to contain the fire, according to officials. On Saturday, President Trump issued a federal emergency declaration for California. In the city of Redding, which has been at the forefront of the Carr Fire, officials sounded more hopeful for the first time in days as the strong winds of the last several days abated. "We're feeling a lot more optimistic today as we're starting to gain some ground rather than being in a defensive mode on this fire all the time," said Bret Gouvea, the California Department of Forestry and Fire Protection's incident commander on the blaze around Redding, which is located about 230 miles north of San Francisco. Firefighter Scott Brown sprays water on a backfire while battling the Carr Fire in Redding, Calif., on Saturday. Despite the improved mood, a sixth person was killed in the fire, according to Shasta County Sheriff Tom Bosenko. The Sacramento Bee reports that the Carr Fire "began surging into Trinity County, where the tiny community of Lewiston, with a population of about 1,100, was evacuated late Saturday." 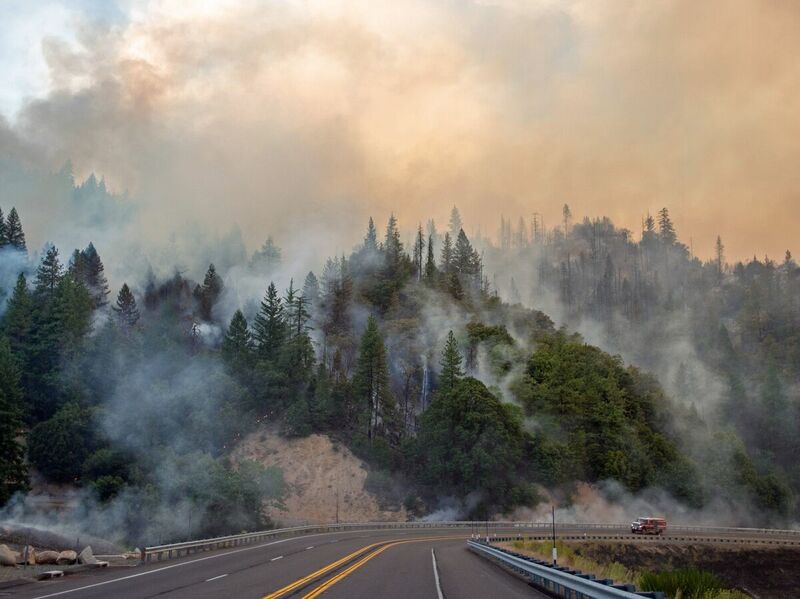 "Late Sunday more evacuations were ordered, stretching from the Buckhorn Summit Road area west of Whiskeytown Lake well into eastern Trinity County. Just two days earlier, public safety officials were urging residents to be ready to evacuate at a moment's notice. On Sunday, their plea to the thousands who fled was markedly different: Be patient about going home." "Fed up, on Sunday morning Tim Bollman hiked 4 miles (6 kilometers) on trails up steep terrain to check on the Redding home he built for his wife and two sons 13 years ago. He found rubble. 'There's not even anything to pick up,' he said. 'It's completely gone.'" Nearby Keswick, a mountain town of about 450 people, "was reduced to an ashy moonscape of blackened trees and smoldering rubble," according to the AP. Two children and their great-grandmother were among the casualties on Saturday. The three apparently failed to heed an evacuation order for the Redding area, according to KCRA in Sacramento. The sixth victim announced Sunday was not identified, but also did not evacuate despite receiving the order, Bosenko said. Bosenko also said that the sheriff's department was investigating seven reports of missing people. The Redding police said they have an additional 11 reports of missing individuals.